What comes to mind when we mention the word prison? Probably steel bars, tough wardens, hard beds, congested cells and horrible food, definitely not Ritz Carlton Riyadh! The above mentioned are the popular images of jail, however, for some prisons around the world that is so not the case. Here is a list of some of the most unusual prisons around the world. Now that it is back, Ritz Carlton Riyadh looks exactly as it was before it became a golden prison. This extravagant 500-room hotel reopened in February 2018 after being a gilded prison for more than 3 months. In an unprecedented anti-corruption purge, the 5 star Ritz Carlton Riyadh was a holding place for several princes, ministers and business moguls. The 381 suspects have been later released in exchange for what officials call financial settlements. Each detainee in this lavish prison was given his own room, complete with room service and television, but no internet or telephone access to prevent contact with the outside world. According to the hotel website, several of the prominent detainees have been kept in the hotel’s royal suites, each comprising a living room, a kitchen, dining room and multiple bedrooms. With its elegant spacious lobby brimming with golden antiques and extravagant indoor pool with a sky-blue ceiling painted with clouds, it is too hard to call the Ritz Carlton Riyadh a prison, but the hotel has indeed been one. Their trending name on Youtube is Dancing Inmates, and these inmates sure can dance! 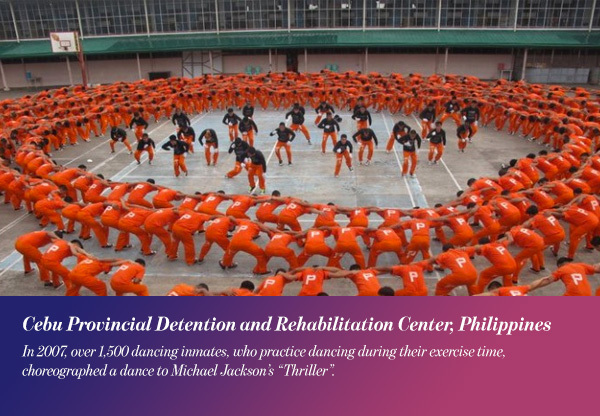 In 2007, over 1,500 dancing inmates, who practice dancing during their exercise time, choreographed a dance to Michael Jackson’s “Thriller”. The video got over 53 million views on YouTube and landed a spot on TIME’s top 5 list of most viral videos of the year. These inmates are definitely the real smooth criminals! 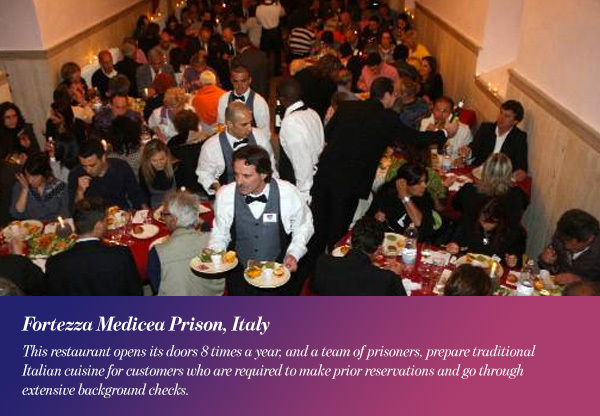 The Fortezza Medicea Prison, located in Volterra, Tuscany, Italy is an old castle that now houses 150 inmates and one of the most exclusive restaurants in the country! This restaurant opens its doors 8 times a year, and a team of prisoners, prepare traditional Italian cuisine for customers who are required to make prior reservations and go through extensive background checks. The restaurant offers a true fine dining experienceو complete with a pianist playing live music. Albeit one with plastic cutlery and under the watchful eyes of guards. 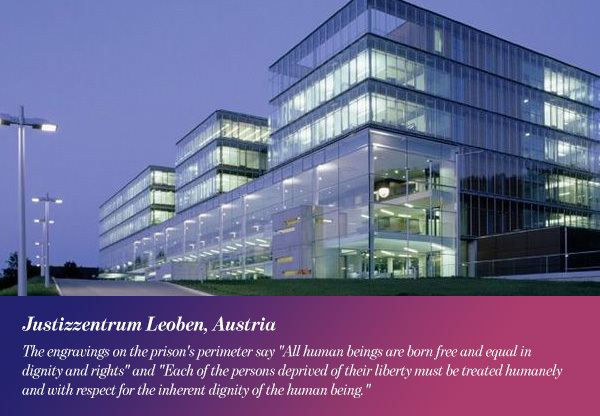 The Justizzentrum or Justice Center court and prison complex was built in 2004, it can house up to 205 inmates at its full capacity, most of them prestigious and wealthy convicts. The fancy prison is mainly made of glass; it features a gym as well as private rooms for guests. 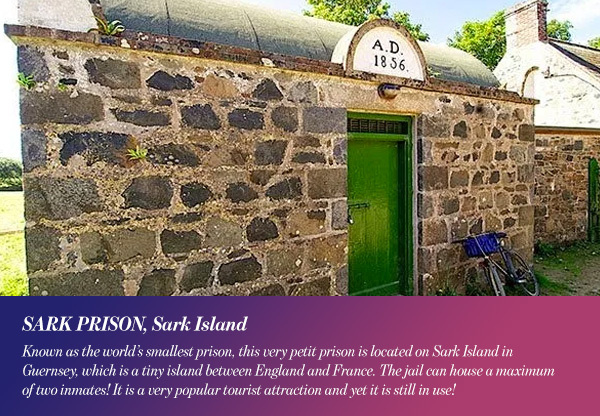 Known as the world’s smallest prison, this very petit prison is located on Sark Island in Guernsey, which is a tiny island between England and France. The jail can house a maximum of two inmates! It is a very popular tourist attraction and yet it is still in use! This unusual prison 18th century structure is made of stone, it was built in the as a Girls School in 1841. Although this prison looks extremely cute from the outside, there are no windows in the holding cell in Sark prison, which makes it extremely dark inside. The 100 inmates inside this prison complex in Bastoy Island enjoy luxuries like tennis, horseback-riding, fishing and sunbathing. Moreover, they live in cute tasteful cottages and work on farms. Can we still call them prisoners? 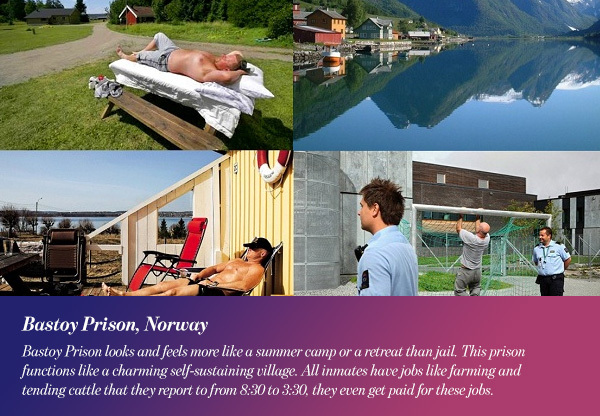 The CNN has dubbed this prison “the world’s nicest prison”. It is hard to disagree when inmates hold the keys to their rooms and there are no armed guards or even fences in this so called prison! The prison was founded in 1982; it is situated on small picturesque island featuring lush greenery and rocky coasts. Bastoy Prison looks and feels more like a summer camp or a retreat than jail. This prison functions like a charming self-sustaining village. All inmates have jobs like farming and tending cattle that they report to from 8:30 to 3:30, they even get paid for these jobs. Officials say that the objective of Bastoy is not to seek revenge or punish the offenders but to reform them. Addiewell prison was opened in 2008 in the village of Addiewell, between Glasgow and Edinburgh. 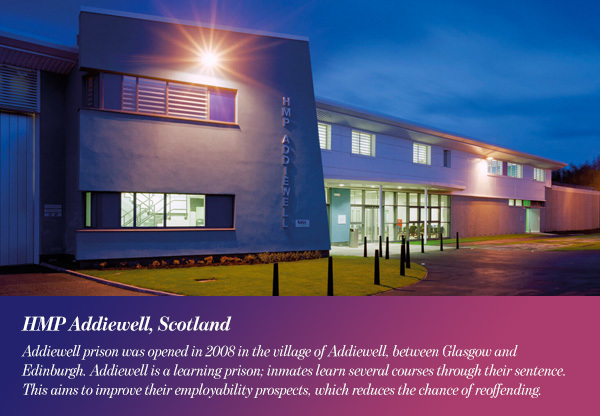 Addiewell is a learning prison; inmates learn several courses through their sentence. This aims to improve their employability prospects, which reduces the chance of reoffending. Each convict is expected to fulfill 40 hours of purposeful activity per week. Purposeful Activity is divided into three main areas: Learning and Skills, Jobs and Programmed Interventions. 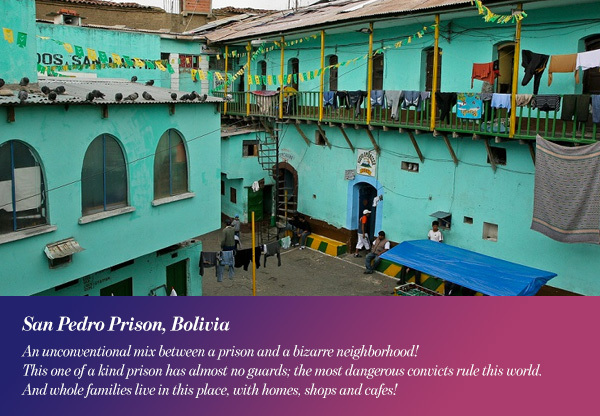 An unconventional mix between a prison and a bizarre neighborhood! This one of a kind prison has almost no guards; the most dangerous convicts rule this world. And whole families live in this place, with homes, shops and cafes! Inmates are expected to pay for their cells, that is why they work within the community. The prison holds 1500 inmate, this does not include the women and children who live with the men.